A talk on Landscape Photography and Art. The Photo-art festival #art140bishkek wants to open a discussion about city development in Bishkek. It addresses citizens interested in Biskeks history and culture. How do the people of Bishkek want the city to develop? How can children grow up in a green, good and prosperous city? Participants of the competition are asked to take a creative approach in the Photo-art Festival #art140bishkek. The festival includes master classes from artists and photographers (festival participants will write and shoot beautiful and interesting corners of Bishkek) at the end an exhibition of selected works will be organized. 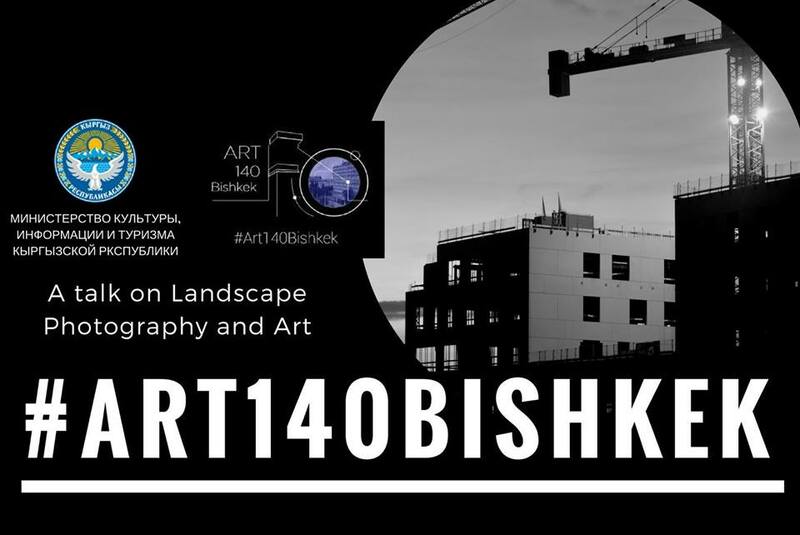 The competition #art140bishkek, officially launched on June 1, 2018, is organized as a visual research and educational initiative aimed at promoting and developing the creative inhabitants of the city and fostering a careful attitude to the nature and infrastructure of the city. • Upload your work (photos or pictures on the topic Bishkek) in instagram or facebook. • Give a brief description of the work (50 – 100 words) in Russian, Kyrgyz or English. We accept: watercolor works, paintings, portraits and other works of fine art, photojournalism, street photography, landscape photography, photo movement, etc . ; Participation rules do not include restrictions, after the appearance of the photo on the network, is published by the administrator on the official page @ art140bishkek in Instagram or on the page Wonderful Kyrgyzstan in facebook. The deadline for submission of works is 20 June 2018. The opening of the festival will take place on June 25, 2018, during a week master classes will be held from famous artists and photographers with the authors of the selected works. The festival includes 2 hours master classes. All the works will be considered by the jury members, which will include experts from different fields. For participants who will pass the qualifying round, during a week master classes will be organized by famous artists and photographers. Winners of 7 nominations will be determined at the exhibition. The best works will be put up for auction. All collected funds will be transferred to the orphanage following the results of the auction.